This all-in-one-bowl cake is delicious, diabetic friendly, and definitely do-able! Diabetics need their desserts just like everyone else and this one is perfect for sharing with non-diabetics too! This recipe makes use of naturally sweet substances like carrot and coconut, is flavoured with cinnamon and vanilla, has a cream cheese frosting, and is pleasantly filling from the whole wheat and chopped almonds in it! I don’t have a photo of a “slice that was cut out” since I baked this cake for an anniversary party. That should explain the carrot heart-art as well! 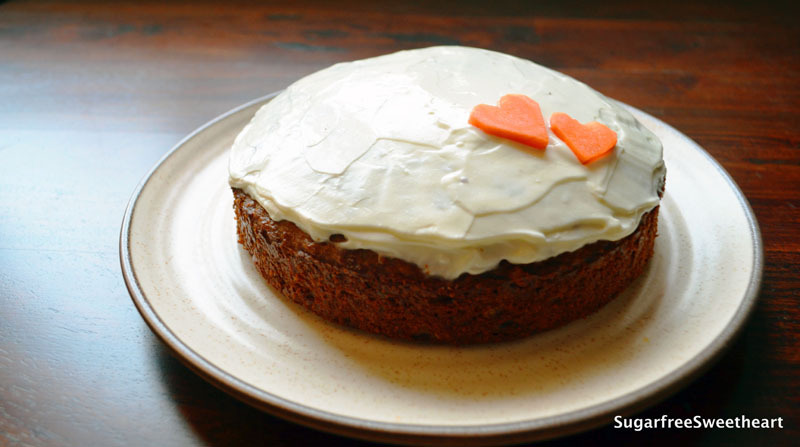 I’ve adapted this Carrot Cake recipe from Betty Crocker’s Carrot Cake Recipe. Apart from making it diabetic friendly, I’ve also adjusted the quantities to make a single round cake 8 or 9 inch, instead of 2 thin round cakes or the 9×13 inch rectangle cake suggested on the website! Also, the cream cheese frosting on the original seemed too much and deadly sweet to me, so I’ve included my alternative lighter, less sweet version that goes great with the cake. This recipe is suitable for diabetics, non-diabetic friends and family, and anyone who loves a dense, moist, carrot-y treat! There’ll be no “sugar-substitute” after-taste and no one will have a clue that it’s whole wheat! Keep your cream cheese out of the refrigerator so it can soften before you use it. Put on some music to bop to for all the grating and chopping! Keep all your ingredients ready before you start making this cake. It’s pretty simple once you have all the stuff in one place! I’ve included the guideline amounts of sugar for the cake and frosting so if you are using a different substitute then you can calculate how much you will need as compared to sugar. 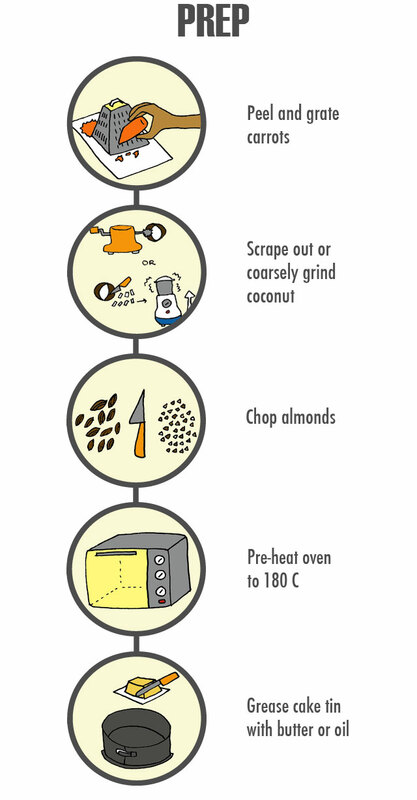 Use walnuts or pecans if you prefer them to almonds! If you would like a lighter option, leave the coconut out from the cake and instead sweeten it lightly and use it as the topping instead of the cream cheese. As with most other baking, the cake is done when a tooth pick inserted in the centre comes out cleanly. Thanks Jade! I’ve been wandering around your blogs and I love it! hey tried it and taste great but it did not rise much. What did I do wrong? Glad you tried it, Baldeep! This cake is quite dense actually but it does rise a bit. Maybe you mixed the batter for a long time? This usually causes the cake to go flat. Thanks for your feedback! Wow.. whole wheat in my cake! Have to try this. Yours looks perfect… hope mine comes out too.